More than 20 million Asian Americans currently reside in the United States. They are currently the fastest-growing racial group in the country, and the population is quickly gaining political power; it will constitute nearly 10 percent of eligible voters by 2036. However, Asian Americans continue to face barriers to the ballot box. Language barriers, voter suppression tactics, and lack of quality engagement from political parties have produced a large, persistent racial disparity in voter turnout. In 2016, more than 64 percent of white Americans turned out to vote, compared with just 49 percent of eligible Asian Americans. This more than 10 percentage point turnout gap has existed for decades and shows no sign of closing without targeted intervention. While Asian Americans are often studied alongside Pacific Islanders under the Asian American and Pacific Islander (AAPI) umbrella, this column focuses on Asian Americans, the community for which more data are readily available and whose needs differ from those of Native Hawaiians and Pacific Islanders (NHPIs). As discussed below, comprehensive data collection and reporting on all AAPI communities in the United States is needed. Despite the Office of Management and Budget directive that federal agencies collect and report data on NHPIs, this standard has not been adopted across all federal data. This disregard by some government agencies to collect and report robust disaggregated data on NHPI communities severely limits policymakers’ ability to address their unique concerns adequately. This column looks at five ways to improve voter turnout in the Asian American community. Asian Americans have roots in more than 20 different countries and dozens of different cultural backgrounds. No one common language exists to unite the group, and there are significant socio-economic differences between ethnicities. Without robust data, policymakers struggle to fully understand and address the unique needs of the communities they serve. Governmental and nongovernmental organizations should recognize that broadly reporting the opinions and experiences of Asians or AAPIs produces incomplete pictures of the Asian American and Native Hawaiian and Pacific Islander communities. Instead, they should follow the lead of efforts from the National Asian American Survey and the Asian American Legal Defense and Education Fund (AALDEF) to conduct in-language polling and analysis on specific ethnic groups. These are invaluable resources that reflect the differing needs and opinions of distinct ethnic communities and provide political organizations with the information necessary to target and serve Asian American voters successfully. Additionally, accurate, comprehensive federal data are necessary to enforce Section 203 of the Voting Rights Act and determine language access requirements in different jurisdictions. Many Asian Americans rely on language assistance at the polls, as discussed below. The current administration’s attempts to undermine the census put these vital data at risk. Comprehensive data collection that is disaggregated by ethnicity would provide candidates and policymakers with a more complete picture of the Asian American community, allowing them to take an active role in increasing Asian American voter participation. Nearly 1 in 3 Asian Americans are limited English proficient (LEP), meaning that they speak English less than “very well.” English proficiency differs significantly by ethnicity—for example, 73 percent of Bhutanese people and 72 percent of Burmese people are LEP, compared with just 20 percent of Indian people and 16 percent of Japanese people. Language barriers prevent individuals from fully participating in the democratic process, keeping them from understanding electoral information and candidate platforms during the campaign cycle. And even when they make it to the polls, LEP Asian Americans face difficulties. Responses to AALDEF’s 2016 exit survey show that in some ethnic communities, as many as 60 percent of voters prefer language assistance when voting. Section 203 of the Voting Rights Act requires certain jurisdictions to provide such assistance at polling places. However, just 27 jurisdictions in the United States are covered for at least one Asian language, and even in covered jurisdictions, language assistance is not always fully available. In one 2012 study, 45 percent of a sample of covered precincts had missing or poorly displayed translated materials, and 23 percent lacked at least one Asian-language bilingual poll worker. Additionally, as populations change, previously covered jurisdictions can lose their status even as communities remain in need. Covered jurisdictions must fully comply with Section 203 by translating voting materials and recruiting and properly training multilingual poll workers. Federal lawmakers should also consider expanding language access by decreasing the minimum population threshold necessary to warrant materials’ translation into a specific language and more generously serving sizable communities that speak a common language. But states and counties should not wait for the federal government’s direction to expand assistance to LEP communities in noncovered jurisdictions. 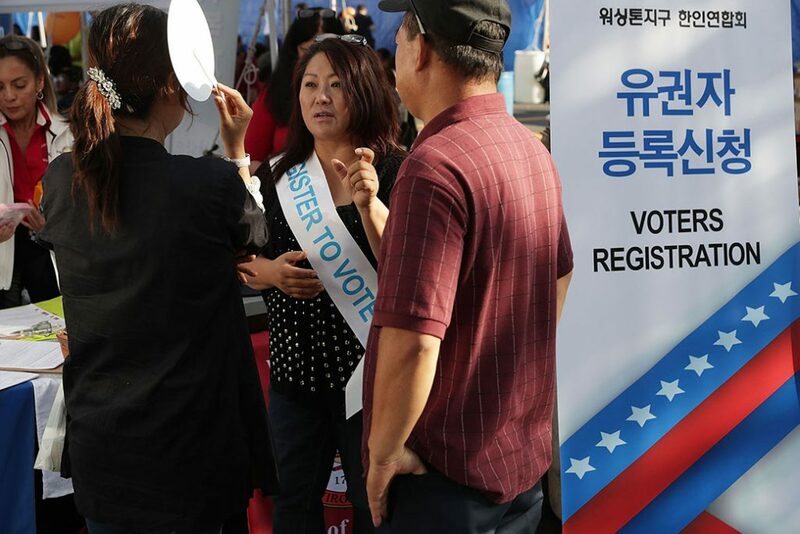 Cook County, Illinois, chose to provide Korean-language ballots ahead of the 2016 election even though it was not required by Section 203, and some states, such as California, have their own state-specific election codes that guarantee language assistance to populations smaller than what is outlined in federal law. Most political campaigns fail to engage the Asian American community properly. In one survey, only 33 percent of Asian Americans reported being contacted by a partisan or nonpartisan organization regarding the 2016 election, compared with 46 percent of whites. Disaggregated data show that among Asian Americans, just 29 percent of Chinese people, 29 percent of Cambodian people, and 20 percent of Hmong people were contacted. Research suggests that contacting voters prior to elections increases their likelihood of voting. In one study, phone banking increased turnout among Asian American communities in Southern California by more than 10 percentage points. The vast majority of Asian American communities are located in a handful of states. For example, nearly one-third of the nation’s Asian Americans live in California. When looking closely at the U.S. population distribution, however, it becomes evident that Asian Americans comprise 5 percent or more of the voting-eligible population in nine states, 79 counties, and 102 congressional districts. Battleground states such as Virginia, Nevada, North Carolina, and Georgia have rapidly growing Asian American populations. Expanding multicultural and multilingual outreach efforts to adequately engage Asian Americans is a necessity. Some states actively remove individuals from voter rolls due to clerical errors, reliance on inaccurate data, or if they suspect the individual voted in another state or has not voted recently. Known as “voter purging,” this blunt voter suppression tactic has disenfranchised thousands of Asian American people. In the 2016 election alone, AALDEF received 281 complaints from Asian Americans about voting problems, including names missing from voter rolls. Ohio’s English-only mailings about confirming voter registration compounded voting difficulties for LEP people in the state. Ohio has purged countless Asian American people who had trouble understanding and responding to the mailings. Similarly, roughly 26 states use the Interstate Voter Registration Crosscheck Program, which relies on first and last names to generate lists of potential double voters. Championed by “the king of voter suppression”—Kansas Secretary of State Kris Kobach—this tactic is widely criticized as being discriminatory and unreliable. Asian Americans with common last names such as Patel and Kim are likely to be wrongly targeted by this program and purged from voter rolls. In fact, a Rolling Stone study found that Asian Americans have a 1 in 7 chance of showing up on a Crosscheck list. Voter purges are a devious form of suppression that have dangerous consequences. Lawmakers must put an end to these policies. Once registered, the turnout disparity between Asian Americans and whites declines significantly. Yet only 56 percent of Asian Americans are registered to vote, compared with 72 percent of whites. Laws around the country have maintained this disparity by making it more difficult for Asian Americans to register to vote. In 2016, Georgia rejected thousands of voter registrations from Asian American applicants because their names did not match up with slightly different spellings on other identification forms, a common problem among transliterated names. Asian Americans were six times more likely than whites to have their voter registrations turned away or delayed because of this practice. Other identification laws discriminate against naturalized citizens: A statute in Louisiana required foreign-born citizens to submit proof of citizenship to register to vote, something that was not asked of U.S.-born citizens. More than 60 percent of Asian American citizens are naturalized. This discriminatory law was only repealed after advocates filed a lawsuit on behalf of Asian and other immigrant communities in the state. Lawmakers must abandon strict identification laws and other unjust voter suppression tactics. Instead, they should enact policies that help make it easier for people to register and vote, such as automatic voter registration, same-day registration, preregistration, and expanded early voting. Racial disparities in voter turnout should not be accepted as the status quo. The Asian American population increased by 72 percent from 2000 to 2015, and by 2043, there will be no clear racial majority in the United States. Removing barriers to voting and taking proactive steps to increase civic engagement among Asian Americans must be a priority for policymakers. In the face of a changing population, society must act to ensure that all Americans, no matter their race or ethnicity, can access the most fundamental right in our democracy—the right to vote. Aastha Uprety is an intern with the Progress 2050 team at the Center for American Progress.